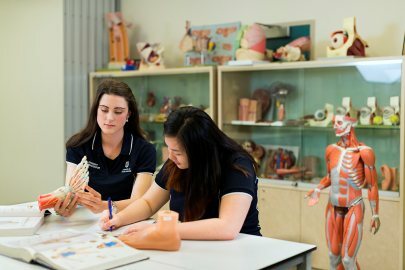 Study Bachelor of Podiatry at the University of South Australia (UniSA). Information for International students. Learn from a University that has well-above world standard research in Clinical Sciences2. Study the only podiatry degree in South Australia. Gain real-world experience when you complete 1,000 hours of clinical placements. Learn from registered practicing podiatrists in the Podiatry Clinics and manufacturing laboratory located on-campus. Benefit from our strong industry links and long-standing history in podiatry education. The only degree of its type in South Australia, you will train as a podiatrist to diagnose and treat disorders of the foot and lower limb. You will develop an advanced understanding of both the theoretical and practical aspects of podiatry, as well as the physical, chemical and social sciences relevant to working in health care. There is a major focus on practical skills, and you will get the opportunity to practice these skills in our contemporary on-campus Podiatry Clinics, where you will work under the supervision and guidance of registered practicing podiatrists. High achieving students may be considered for the Bachelor of Podiatry (Honours) program in the third year of study. As a podiatry student you will gain an advanced understanding of both the theoretical and practical aspects of podiatry, as well as the physical, chemical and social sciences relevant to working in healthcare. You will also learn the aspects of medicine and surgery relevant to diagnosing and treating foot abnormalities. You will also develop advanced communication skills and explore the assessment and treatment of common podiatry problems. The second year aims to expand your knowledge on clinical sciences, including studies in assessment protocols and procedures. During your third and fourth years you will develop advanced clinical practice skills, including surgery (and other orthopaedic management), paediatrics, chronic pain and the management of sporting injuries. Practical learning is a major focus and some of your learning will take place in our on-campus Podiatry Clinics as well during external placements in metropolitan and rural locations. Placements may be completed at major hospitals, or in private practice. 3. Students are required to satisfy the standard of dress and behaviour as prescribed by institutions in which clinical placements are undertaken. Failure to do so may prevent them satisfying the requirements for completion of the program. 4. Students will be required to spend at least one clinical placement in a country or interstate location. 5. Students must hold a current Cardiopulmonary Resuscitation certificate at the commencement of Year 2 of the program and maintain its currency for the remainder of the program. 6. Students will be required to undertake a Certificate of Mandatory Notification Training before commencing their paediatric clinical practice in REHB 4038 and REHB 4040 Podiatry Practice 400 and 401. 7. The program requires participation in practical classes where manual skills are practiced. Essential learning activities in some classes may require that students partially remove their clothing to a level that is appropriate to the learning activity. Students may also be asked to act as subjects for their peer group members. If a student is unable to meet these requirements they may be at risk of being unable to successfully complete course objectives and assessments and progress through the program. 8. Participation is required in practical classes and clinical placements where students are required to physically handle people including lifting and supporting people with disabilities. 1. The Elective is a free elective to be selected by the student. 2. Students may be required to undertake clinical practice sessions outside of teaching weeks. We offer state-of-the-art learning facilities, including a contemporary on-campus Podiatry Clinic where you can practice your skills under the guidance and supervision of registered practicing podiatrists. You will carry out podiatric assessment and treatment on members of the public, with the complexity of management increasing with each year of study. Plus, you will gain further practical experience when you complete 1,000 hours of professional experience during which you will be required to complete a range of clinical activities involving the provision of screening, education and treatment services in rural areas. You will be taught by registered practicing podiatrists and award-winning academics, ensuring you graduate career-ready. You will also build important industry connections when you complete a substantial industry placement as part of your studies. Successful podiatrists not only possess excellent motor skills, but also outstanding communication skills. If you are interested in working with people and promoting wellbeing, this may be the degree for you. The program is recognised for registration as a Podiatrist by the Podiatry Board of Australia. I am proud to lead a degree that is successful in educating and growing students into work-ready professionals, who graduate and have instant impact in changing people's lives and improving their health and wellbeing. This is achieved through the high-quality teaching and practical aspects offered by our program, facilitated by the enthusiastic and supportive educators who are also active podiatrists themselves. I was interested in the sports and anatomy areas of health, but also skins and diseases. I have done placements in Broken Hill, and Whyalla, the rural placements were really enjoyable as they allowed me to see a different range of clinical cases that I may not get to see in metropolitan areas. I did placements in the University of South Australia Podiatry Clinic and in external organisations in both metropolitan and rural settings. These placements, along with the weekly clinic sessions, equipped me with the confidence and experience needed when entering the workforce.